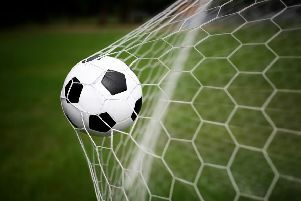 Bexhill United Football Club reached the semi-finals of its divisional cup competition after beating AFC Varndeanians for the third time this season. The Pirates struck twice in either half to win 4-2 in a keenly contested and entertaining Macron Store Southern Combination League Division One Challenge Cup quarter-final at The Polegrove tonight (Tuesday). Liam Foster gets to grips with an AFC Varndeanians opponent. Playing with the blustery drizzle at their backs, Bexhill had the better of the first half and led 2-1 at the break having had a penalty saved at 1-0. The opening half-hour was goalless, although Varndeanians goalkeeper Jordan Hawkins made four saves to keep Bexhill at bay. Hawkins used his feet to block Georges Gouet’s first time shot from inside the box and a Gordon Cuddington effort after the Bexhill forward had pounced on a defensive mistake and gone through on goal. He also held Luke Woodley’s long range chip above his head and made a smart save low to his left from Cuddington after Bexhill counter-attacked well from a Varndeanians corner. On top of that, Lewis McGuigan headed wide from Liam Foster’s free kick early on. Corey Wheeler takes on an opponent. At the other end, Dominic Hemblade’s shot from outside the area flashed just wide and Bexhill full-back Ben Cornelius made an important block from a goalbound David Altendorff effort. Bexhill made the breakthrough in the 31st minute. After Woodley unsuccessfully appealed for a penalty when challenged by Hawkins, the resulting Foster corner was headed back into the danger area by Craig McFarlane for Cuddington to nod in from close range. After David Mitchell’s shot on the turn went just wide, Varndeanians were whiskers away from a 36th minute equaliser. Away forward Connor Martin got to a ball over the top just before outrushing Bexhill goalkeeper Dan Rose and poked it past him, but McGuigan raced back to effect a terrific sliding clearance from near the goal-line. Bexhill had a golden opportunity to double their advantage five minutes later. Gouet was pulled down by Jordan Peskett in the right-hand side of the box, but the usually deadly Craig Ottley saw his penalty well saved by Hawkins diving to his right. Georges Gouet on the ball. The hosts did go two-up in the 44th minute with almost a carbon copy of their first goal. Another deep Foster corner from the left was headed back by Cuddington and into the net by the jubilant McGuigan. Varndeanians pulled one back in the first minute of added time. Rose fouled Altendorff as the two players slid in together in the box and Ryan Walton rolled home the ensuing penalty. The visitors almost equalised two minutes after half time when Rose did well to save Martin’s far post header from a left wing corner with his feet. A minute after that, Bexhill restored their two-goal cushion. Foster’s angled shot was blocked by Hawkins, but the ball ricocheted across the area and as it bounced up, Gouet drilled a sweetly-struck shot into the back of the net. Liam Foster keeps his eye on the ball. Bexhill looked in charge for the most part thereafter, although Varndeanians did threaten now and then. Mitchell shot just wide of the near post after Martin flicked on a long ball, while one Altendorff header from a free kick went just wide and another was tipped over by Rose. At the other end, Gouet skipped past two defenders before seeing his shot saved and Cuddington’s low drive from just outside the box went narrowly wide. Varndeanians cut their deficit to 3-2 in the 82nd minute. Following a low cross from the away left, Altendorff’s mishit shot, which was going wide, was headed in by Elliott Wood. Bexhill started to get a bit edgy until wrapping up their victory with a fourth goal in the 88th minute. The skilful Corey Wheeler got on the end of Cuddington’s ball over the top, held off the defender and teed up fellow substitute Wayne Giles for a simple finish. Varndeanians kept plugging away and in added time Walton’s firm drive was tipped over by Rose before a header at a corner was nodded off the line by Wheeler. Bexhill’s reward is a semi-final meeting with St Francis Rangers or Oakwood, whose quarter-final was postponed, on a date to be announced. Bexhill: Rose, Cornelius (Giles 86), Ottley (Wheeler 66), McFarlane, McGuigan, Holden (Beale 80), Gouet, Robertson, Cuddington, Foster, Woodley. Sub not used: Harffey.